West Burton in Wensleydale is said to be one of the most beautiful villages in the Yorkshire Dales National Park. It lies in a deep sheltered valley at the junction of Walden Dale, Bishopdale and Wensleydale just off the B6160 road, which eventually leads to Addingham. There are two no through roads that leave the village at the far end, but one only leads to the hamlets of Walden and Walden Head. The steep sided hills that surround this jewel of a village form a spectacular setting and on climbing can give fantastic panoramas of the surrounding dales and distant views of the Vale of York and North York Moors. West Burton has a broad village green, centred by an ancient market cross, and the green also offers a children’s play area and plenty of benches to sit and relax and watch the world go by. There is also a pub, the Fox and Hounds Inn, a post office/shop, tearoom/gallery and a butchers shop as well as The Old Smithy Antiques, Moorside Designs Cat Pottery and Aardvark picture framers to keep the visitors entertained. Walden Beck skirts the village and descends over rocky outcrops to form a small but spectacular waterfall and visitors have been drawn to West Burton’s Cauldron Falls since the famous artist J.M.W Turner captured its wonderful magic. When the falls are in full spate in the winter or after a lot of rain you can actually walk behind it. Aysgarth is a village also in the Yorkshire Dales National Park and gives its name to the nearby Aysgarth Falls. The 17th century George and Dragon Inn, an old coaching inn, is now a Grade II listed building serving local real ale from the Black Sheep Brewery and the Yorkshire Dales Brewing Company. St. Andrew’s Church, on the outskirts of the village, rebuilt in 1536 and restored in 1866, has a very large churchyard of about four acres and is now a Grade II listed building. Inside the church there are fittings and features that were saved by the monks from Jervaulx Abbey at the Dissolution of the Monasteries. The best features being the great Rood Screen and the Abbot’s Stall. It also once had the stone head of an important 10th century Saxon cross but that was stolen in 1996. Aysgarth Falls near the village of Aysgarth are a triple flight of waterfalls carved out by the River Ure and stretches over one mile. The falls, surrounded by forest and farmland, are spectacular in wet weather as the water cascades over a series of broad limestone steps. 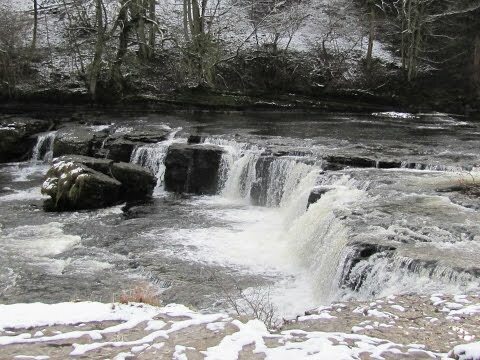 Although not very high the waterfalls are one of Wensleydale’s most famous beauty spots with a riverside walk linking the Upper, Middle and Lower falls thus attracting many visitors for many years. The falls have been visited by William Wordsworth and John Ruskin and painted by J M W Turner. The falls were featured on the TV programme Seven Natural Wonders as one of the wonders of the North and The Upper fall was featured in the Kevin Costner film “Robin Hood – Prince of Thieves”. Aysgarth Falls is part of the Freeholders’ Wood Local Nature Reserve and is protected as a Site of Special Scientific Interest. The Aysgarth Falls National Park Centre adjacent to the Nature Reserve has parking, a shop, cafe and toilets. We park at the side of the road in West Burton and walk across the green to the Fox and Hounds Inn then walk down the one way road past the village shop and tearoom. At the sign post on the left for Eshington Bridge go through the gate between the houses and walk down the little narrow footpath to the road. Take the footpath opposite slightly to the right and head forwards over the field to the barn. Go through the gateway to the left of the barn and head forwards over the next field to the beck. Turn right over two stiles and head forwards to the wall in front and bear right to the yellow tipped post and head forwards over the stile. Keep heading forwards over the next field and go through the stile onto the road. Turn left, walk over the road bridge and bear right. After 50 yards take the footpath on the left through the gate sign posted Palmer Flats and head towards the barn. Go over the stile in the hedge and over the next stile just a few yards in front. Walk across the field to the right of the barn and go over the stile. Walk downhill into the dip and back up the other side and go through the hedge and cross the next field to the main road, the A684. Cross straight over and take the lane to St. Andrew’s Church. At the front of the church turn left and follow the path to the road and turn right steeply downhill to Aysgarth Falls, the Mill, teashop and craft shop. We cross over the bridge (Yore Bridge) and turn left on the footpath to view the Upper Falls (High Force). We return to the bridge, (Aysgarth National Park Centre is up the hill) cross over and take the two flights of steps between the mill and the building, crossing the mill race, back up to the church. On entry to the church yard turn left through the gate with a yellow arrow and follow the path round the back of the church. At the side of the church turn left on and follow the path to go through a gate and then head forwards uphill to through the wood opposite. When we come out into the open we walk along the top then drop down to the River Ure to view Middle Force and Lower Force. We then make our way back to the top and follow the path above the river. We cross over a field to the road, the A684, and turn left. Just after the bridge and before the AA box take the footpath on the left to the right of the barn in front. Follow the footpath signs through the small wood and then follow the river through the fields to the stepping stones. We now turn right and walk along the track between the stone walls (some of the wall on the right is missing in places) back to the road, the A684. We turn left along the road until we reach a folly on the left. Turn right here through the fence and take the right footpath sign posted Morpeth Gate. Go over the stile and head forwards across the field go through the gate and head slightly right to the wood. Go into the wood and bear left for a short way and when the track turns to the right we bear left and follow the wall on the left. Go through the gate and follow the wall on the right through the fields. On reaching a walled track we turn right and follow the track for a short way and take the footpath on the left, hidden in the trees, sign posted West Burton via Barrack Wood. We head forwards across the field into the trees and follow the fence on the right until we reach a stile in the fence. We turn right over the stile and head downhill through the field, go through a gate and down a narrow path until we reach the bridge and Couldron Falls at West Burton. Go over the bridge and turn left back into West Burton village. This is a moderate walk through fields and on uneven paths. Some steep inclines and declines. Care to be taken near the waterfalls especially in wet weather. Approx 6 miles allow 2 hours 30 minutes using OS map OL30, Yorkshire Dales Northern and Central Areas. Wensleydale, Swaledale. Start Point: West Burton village green. West Burton, Wensleydale in the Yorkshire Dales. From the A1 take the A684 to Bedale. At the cross roads turn right still on the A684 to Layburn. Turn left at the roundabout still on the A684 through Wensley, West Witton and Swinithwaite then after about 2 miles take the left turn for West Burton then take the next left to take you into the village. Free road side parking in the village. There are no public toilets at West Burton but there are some at the Aysgarth Falls Tourist Information Centre. For refreshments there is the Fox and Hounds Inn with B&B accommodation, post office/general store, tea room and a butchers shop at West Burton and the Mill Race Tea Shop and a Craft Shop next to the bridge at Aysgarth Falls. The Aysgarth Falls National Park Centre, with a cafe and shop is open daily April to October and Friday, Saturday and Sunday November to March. There is also the George and Dragon Inn in Aysgarth village itself.